Definition at line 124 of file dde_private.h. Definition at line 131 of file dde_private.h. Definition at line 132 of file dde_private.h. Referenced by DdeConnect(), and WDML_GetLocalConvInfo(). Definition at line 128 of file dde_private.h. Referenced by DdeReconnect(), WDML_AddConv(), WDML_FindConv(), WDML_GetLocalConvInfo(), WDML_RemoveConv(), and WDML_RemoveServer(). Definition at line 129 of file dde_private.h. Referenced by DdeReconnect(), WDML_AddConv(), WDML_EventProc(), WDML_FindConv(), WDML_GetLocalConvInfo(), WDML_HandleReply(), WDML_RemoveConv(), WDML_ServerHandleAdvise(), WDML_ServerHandleExecute(), WDML_ServerHandlePoke(), and WDML_ServerHandleRequest(). Definition at line 136 of file dde_private.h. Referenced by DdeSetUserHandle(), WDML_AddConv(), and WDML_GetLocalConvInfo(). Definition at line 133 of file dde_private.h. Referenced by DdeDisconnect(), DdeImpersonateClient(), DdePostAdvise(), DdeReconnect(), WDML_AddConv(), WDML_BuildExecuteCommand(), WDML_ClientHandle(), WDML_EventProc(), WDML_GetLocalConvInfo(), WDML_HandleIncomingTerminate(), WDML_PostAck(), WDML_RemoveConv(), WDML_RemoveServer(), WDML_ServerConvProc(), WDML_ServerHandleExecute(), WDML_ServerHandleRequest(), WDML_ServerHandleTerminate(), and WDML_SyncWaitTransactionReply(). Definition at line 134 of file dde_private.h. Referenced by DdeConnect(), DdeDisconnect(), DdeImpersonateClient(), DdePostAdvise(), DdeReconnect(), WDML_AddConv(), WDML_BuildExecuteCommand(), WDML_ClientHandle(), WDML_EventProc(), WDML_GetLocalConvInfo(), WDML_HandleAdviseReply(), WDML_HandleExecuteReply(), WDML_HandleIncomingTerminate(), WDML_HandlePokeReply(), WDML_HandleRequestReply(), WDML_HandleTerminateReply(), WDML_HandleUnadviseReply(), WDML_PostAck(), WDML_RemoveConv(), WDML_RemoveServer(), WDML_ServerConvProc(), WDML_ServerHandleRequest(), and WDML_ServerHandleTerminate(). Definition at line 127 of file dde_private.h. Referenced by DdeAbandonTransaction(), DdeClientTransaction(), DdeDisconnect(), DdeEnableCallback(), DdePostAdvise(), DdeReconnect(), DdeSetUserHandle(), WDML_AddConv(), WDML_BuildExecuteCommand(), WDML_ClientHandle(), WDML_ClientQueueAdvise(), WDML_ClientQueueExecute(), WDML_ClientQueuePoke(), WDML_ClientQueueRequest(), WDML_ClientQueueTerminate(), WDML_ClientQueueUnadvise(), WDML_EnableCallback(), WDML_GetConv(), WDML_GetLocalConvInfo(), WDML_Global2DataHandle(), WDML_HandleAdviseReply(), WDML_HandleExecuteReply(), WDML_HandleIncomingData(), WDML_HandlePokeReply(), WDML_HandleReply(), WDML_HandleRequestReply(), WDML_HandleTerminateReply(), WDML_HandleUnadviseReply(), WDML_PostAck(), WDML_RemoveConv(), WDML_ServerConvProc(), WDML_ServerHandleAdvise(), WDML_ServerHandleExecute(), WDML_ServerHandlePoke(), WDML_ServerHandleRequest(), WDML_ServerHandleTerminate(), WDML_ServerHandleUnadvise(), WDML_ServerQueueAdvise(), WDML_ServerQueueExecute(), WDML_ServerQueuePoke(), WDML_ServerQueueRequest(), WDML_ServerQueueTerminate(), WDML_ServerQueueUnadvise(), and WDML_SyncWaitTransactionReply(). Definition at line 130 of file dde_private.h. Referenced by WDML_AddConv(), WDML_GetConv(), and WDML_RemoveConv(). Definition at line 126 of file dde_private.h. Referenced by DdeAbandonTransaction(), DdeEnableCallback(), DdeUninitialize(), WDML_AddConv(), WDML_EventProc(), WDML_FindConv(), WDML_RemoveConv(), and WDML_RemoveServer(). Definition at line 135 of file dde_private.h. 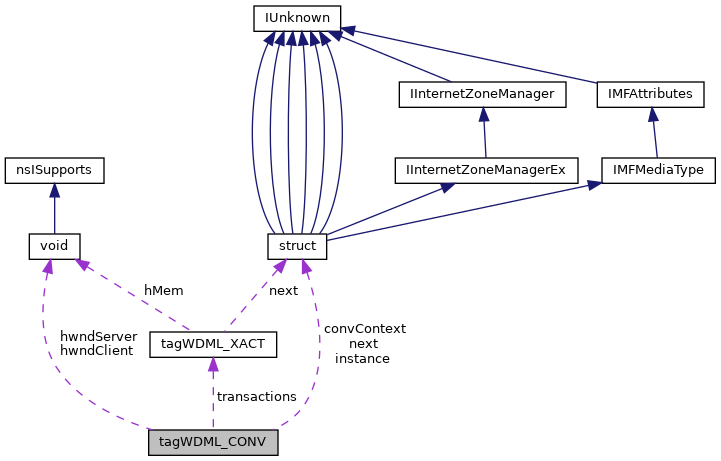 Referenced by DdeAbandonTransaction(), WDML_AddConv(), WDML_EnableCallback(), WDML_FindTransaction(), WDML_HandleReply(), WDML_QueueTransaction(), WDML_RemoveConv(), WDML_SyncWaitTransactionReply(), and WDML_UnQueueTransaction(). Definition at line 138 of file dde_private.h. Referenced by DdeConnect(), WDML_AddConv(), and WDML_GetLocalConvInfo(). Definition at line 137 of file dde_private.h. Referenced by DdeAbandonTransaction(), DdeClientTransaction(), DdeDisconnect(), DdePostAdvise(), DdeReconnect(), WDML_AddConv(), WDML_ClientHandle(), WDML_ClientProc(), WDML_ClientQueueTerminate(), WDML_EnableCallback(), WDML_EventProc(), WDML_GetConv(), WDML_GetLocalConvInfo(), WDML_HandleIncomingTerminate(), WDML_PostAck(), WDML_ServerConvProc(), and WDML_ServerNameProc().